Our Sarasota, FL locations are the bees-knees! Compass Self Storage in Sarasota offers numerous features and amenities to make your self storage experience positive and stress-free. We don’t try to lock you into a lengthy lease commitment. Our month-to-month leases provide flexibility for both business and personal storage customers. Whether you need summer storage for your personal belongings while you’re on break from the University of South Florida, or you need long-term storage for your important business records, we can help. Our self storage facility Sarasota, FL, offers climate-controlled units to keep your stored items protected from Florida’s sweltering heat. Humidity-control protects your stored items from damp, mold, and mildew. Units are available in several different sizes and dimensions, so you’re sure to find a unit that meets your storage size requirements. We also have a full canopy for weather protected loading and unloading, and we’re accessible by 18-wheelers. Our North Sarasota self storage facility is kept exceptionally clean and very well maintained. We offer complete climate-controlled self storage units in a variety of sizes. Our beautiful multi-story storage building boasts a full canopy for unloading, which protects you and your stored items from the sun and rain. We have a modern state-of-the-art security monitoring system to give you peace of mind. And we’re conveniently located in the heart of Bradenton and Sarasota. In addition, we accept deliveries on your behalf for free, and we’re an authorized U-Haul dealer. We are well-equipped to handle both personal and business storage needs. Whether you’re cleaning out your garage and need a place to store excess equipment, you’re an eBay seller with more inventory than your office or home can handle, or you’re a business owner needing to store important business records, we can help. Leases are on a month-to-month basis, which gives you excellent flexibility. Compass Self Storage in Sarasota is located on Florida Street, just off University Parkway and a short distance east from US 301 (N. Washington Boulevard). 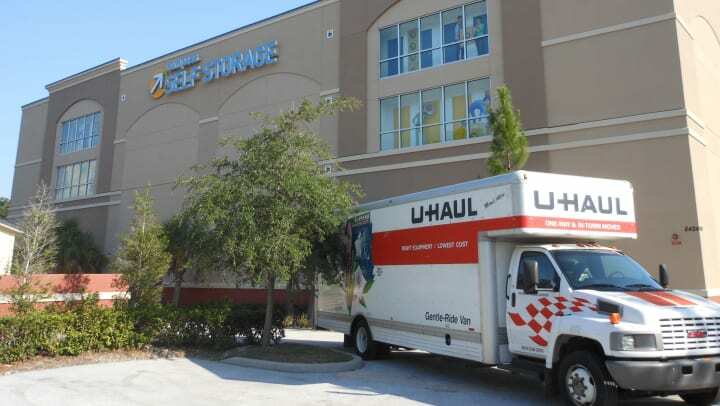 We are pleased to provide excellent self-storage to Sarasota, Bradenton, and surrounding areas. Visit us during our extended rental office and store hours to tour our Sarasota self storage facility and ask about your self storage options.